Earlier in the year, I was at NDC Oslo in Norway where I recorded a couple of Pluralsight Play by Play courses with my good friend Lars Klint. One of those courses, called Developing Engaging Digital Reality Experiences is now available for Pluralsight subscribers to watch. A Play by Play course is a little different to a conventional Pluralsight course because it is filmed in front of cameras as opposed to narrated slides. A Play by Play course is unscripted and is a conversation between the two of us about a particular subject. The subject is meant to be narrow enough for us to have a good discussion about it in around an hour. These courses are great for opening peoples minds up to different subjects or ways of working or thinking. The photo above was taken while we were filming in Oslo. I recorded two courses with Lars that day, and this is the first one to be released. They are great fun to record, if a little scary at first with all the camera, lights, and mics. Thankfully I didn’t need the anti-glare makeup powder, even though it was very hot in that room. This is the 2nd Play by Play I have had this year. The first was about Enterprise data security and encryption key management in Azure. This course is all about virtual reality, augmented reality and mixed reality with the Microsoft Hololens. In this course, Lars was the subject matter expert, and my job was to drive the conversation by asking the questions that the viewer might ask when learning the subject. We cover a lot of ground in this course, and Lars also demonstrates some of the tools used, like Unity 3D, for creating engaging Hololens experiences. Play by Play is a series in which top technologists work through a problem in real time, unrehearsed, and unscripted. In this course, Play by Play Developing Engaging Digital Reality Experiences, Lars Klint and Stephen Haunts introduce the fundamentals of the major pillars in designing and building universal apps for HoloLens in particular. Learn how to use gaze, gestures, voice, and audio to create an app that is immersive and engaging. By the end of this course, you’ll understand the possibilities as a developer in creating a virtual world, where a mixed reality app uses the real world around you. I have made another video on my YouTube channel, and in this video, I ask the question, should you quit your job? Where I am going with this, is should you stick at a job that you don’t like, working for someone else, or should you try and pursue your passions. Pursuing your passions is a great thing to do, but you need to be prepared and do some planning, especially financial planning. In this video I go through my personal story, and talk a bit about the financial planning I did prior to making this move. I also introduce the idea of Active vs Passive income which I will explore in more detail in another video. I’ve Started a YouTube Channel – HELP US ALL!! I recently quit my job to go it alone, which is both exciting and terrifying. I want to document this journey and also share lots of other information. Normally I would do that on this blog, but writing and editing posts frequently takes a lot of time and I am struggling to do it. Recording a short video and editing it takes no time at all, so I am experimenting with this new medium. I have put up my first video which is an intro video to the channel. It feels very off seeing your self on the screen, but I will just have to get used to it. I want to make this channel useful and not just a diary so I will be discussing lots of topics around software development, leadership, working from home, passive income and other things that I find interesting. I also want to do some interviews with people that work for themselves too to get their insights. 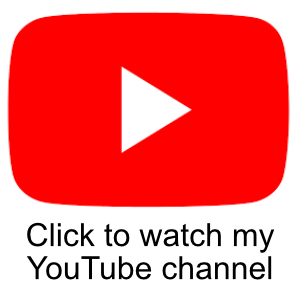 If you are interested in listening, then please hit the youtube subscribe button to follow along. Even though this is the first proper video, it was actually loads of fun to do. I filmed it on my new iPhone 8plus because the front-facing camera shoots in full 1080p HD video, which means I get a higher resolution and I can see what I am doing on the screen which makes this much easier. Sadly this means my bigger camera which also shoots nice video, is a little redundant. oops. iPhone 8Plus filming with the front-facing camera. The quality of the video on the iPhone 8Plus is excellent. The video I recorded today was on a fairly dull day so the light wasn’t amazing, but the video looked bright and the sound was excellent. The only adjustments I had to do was run a little noise reduction over the audio, but that was it, apart from cutting out a few duff lines. The rest is pretty much raw from the camera phone. I have recently been working on a series of new books with the intention of self-publishing them. The first of those books called A Gentle Introduction to Agile Software Development is now out on Amazon as an e-book and a paperback. I have a whole series of these books to release over the next 6 months. They have been great fun to write. I have released the Kindle book at a very low introductory price at the moment. If you buy the book at this rate, I would be very grateful for a good review on Amazon. Here are some links for Amazon UK and the UK. Learning new software development processes can be difficult, but switching to Agile doesn’t need to be complicated. Explore the theories behind Agile Software Development, and learn how to make it work for you. In a Gentle Introduction to Agile Software Development, author Stephen Haunts will guide you to a fuller understanding of Agile, Scrum, and Extreme Programming. You will learn about the advantages and disadvantages, and how to get the most out of it.